Dress up 12" squares of STYROFOAM™ Brand Foam in stylish, colorful, inexpensive scrapbook papers. For less than $5 per square, you can create custom art that reflects you! If using 12" x 12" x 1" squares, skip to Step 2. Wax serrated knife with candle stub or paraffin. Measure and cut each foam sheet into three 12" squares. Or, use dental floss: stand the sheet on its edge, and hold a 20" length of dental floss along the scored line, positioning one hand at the bottom of the board and the other at the top; draw the dental floss down through the foam sheet along the scored line. Use putty knife to spread thin, even coat of paste onto front of first foam square, or apply liquid glue. Center one sheet of paper on pasted foam; smooth paper with fingers. Repeat to cover all foam squares. Beginning and ending at one lower corner, use glue gun to secure ribbon around edges of each foam square; trim excess, allowing a bit of overlap. 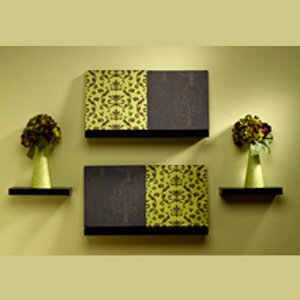 Display panels in pairs on small shelves as shown or, if desired, use level and poster adhesive to secure squares to wall. You may also glue sawtooth hangers to top center back of each foam square and hang with small nails. Heavier paper and cardstock will deliver smoother results. While glue is wet, the paper might appear wavy. As glue dries, the paper will smooth out. STYROFOAM Brand Foam is very forgiving. If the paper square does not meet the edges of the foam square exactly, run the edge of the foam square along a tabletop, compressing the foam.